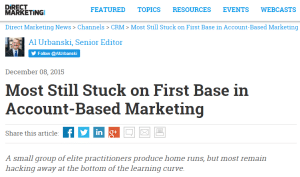 The Account Based Marketing Consortium is live! Wow, we had approximately 800 registrants for our live webinar this morning and a great article in Direct Marketing News. Al Urbanski describes our inaugural primary research and really nails it… even those who have deployed ABM programs still have a LOT of upside. In the coming days we will share many elements of the primary research that backs up this great article. The bottom line is that ABM is not a “check box” or a quick fix. ABM is an incredibly valuable addition to B2B marketing but it requires strategy, alignment with sales, and great content. And more.